Yale Professor William Nordhaus attends a press conference on October 8, 2018 after sharing the 2018 Nobel Prize in Economic Sciences at Yale University. Prof. Nordhaus's research has been focused on the economics of climate change, economic growth, and natural resources. He favours a carbon tax. There is a simple, yet important formula implied in two articles in The Globe and Mail on Tuesday. 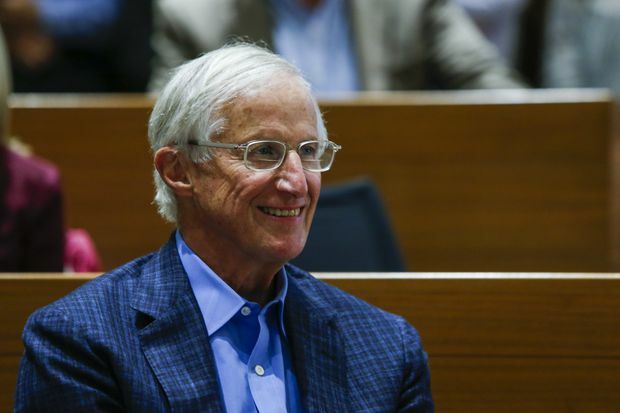 2) William Nordhaus, co-winner of the 2018 Nobel Prize in Economics, says a carbon tax is the best way to address greenhouse gas emissions (Work On Climate Change, Innovation Wins Economics Nobel For Nordhaus, Romer – Report on Business). 1 + 2 = a better future for Canada and the world. We must stop listening to blowhard premiers, including Ontario’s, who give us short-term promises of more money, while at the same time endangering our long-term future. Voters consider many factors when supporting a specific candidate. I travelled in the Chicoutimi area as a student, and in limited French, quizzed my B&B host about why he voted for both René Lévesque’s party and Pierre Elliott Trudeau’s. It boiled down to “mais oui,” a shrug and a smile indicating that indeed he does, and why wouldn’t he? Canadians voted for a Liberal government in 2015 for many reasons, including a carbon tax. In some provinces, the same people have since voted for governments which reject it or are opposed to particular aspects of its implementation. Is it not possible that voters support a carbon tax, even if they endorse provincial parties with other priorities? It is a pragmatic tool to shift to the carbon-neutral society our descendants need. Re Carbon Taxes Shouldn’t Come At Small, Medium-Sized Businesses’ Expense (Report on Business, Oct. 5): For more than a decade, my team has worked with nearly a thousand Canadian businesses with 500 or fewer employees. By making minor changes, these enterprises have reduced their greenhouse gas emissions 11 per cent – yielding an average annual savings of $27,000; top performers have cut carbon emissions an impressive 30 per cent. These enterprises – including, for example, printers, food processors, roofers and retailers – are profitably reducing their carbon footprints, and driving clean innovation and clean growth. Our report, 200 Million Tonnes of Opportunity, concludes that, with targeted coaching and support, Canada’s small- and medium-sized businesses could collectively make a massive dent in the nation’s carbon inventory. Far from sitting ducks, thousands of private-sector clean-growth leaders are showing us how it’s done. - The global ecological crisis, foreseen by scientists for decades, deniers and opponents of which figure prominently among the wealthy backers of populist, jingoistic movements. Their success in exploiting and harnessing the fears and resentment clearly identified by Mr. Harper is a key feature of contemporary politics, particularly in the U.S. So, yes, “global co-operation” in search of “pragmatic, resilient and sustainable solutions” is, as Mr. Harper notes, absolutely necessary. But it may only be possible by revamping, perhaps replacing an economic system geared to the relentless pursuit of wealth accumulation. The pursuit of commoditized pleasures distracts people from learning and thinking deeply about politics, enabling wealthy manipulators to support those who offer simplistic, populist attempts at solving problems produced by that destructive, unevenly developed and increasingly unfair economic system. Re A Judicial Mess And Its Lessons For Canada (editorial, Oct. 8): There is a vigorous, frank and confidential vetting of judicial candidates to our Supreme Court. Moreover, we know who these candidates are through a review of their judicial decisions and conduct, including their temperament. Most importantly, the underlying principle of respect by Canadians for the institution, and the independence of the judiciary, remains at the core of our appointment process, no matter what government is in power and even if that government may want to try to shape the top court. Your suggestion that “a Kavanaugh would have sailed onto the court” in Canada is simply not supportable. His nomination, even if it left the harbour, would have floundered on the rocks of our screening process. Re Canadian Doctors Quit Global Medical Body (Oct. 8): The doctors representing the Canadian Medical Association quit the World Medical Association (WMA) because they considered the main address by the WMA’s new president to have been been plagiarized. How small-minded, even though they may even have been partially correct. The speaker, after all, was addressing the very important topic of physician burnout, which is very relevant in the Canadian scenario, where we are well aware of chronic physician shortage, especially in rural areas. What does it matter that somebody has said this before? As a practising physician who has been at the receiving end of this so-called burnout and its consequences, I have no problem with anybody repeating those words over and over again, no matter how many people have said them before. David Smith, MD, Princeton, B.C. It is fitting that while visiting Iceland, the Canadian Medical Association delegation was able to see a glacier – which moves at the same slow pace as most hospital wait times. That is a more important issue for them to solve. Re Humph! (letters, Oct. 9): Your correspondent got into a pickle solving Friday’s crossword, and I also was initially in a jam, but luckily realized the two words can be synonyms.